Are you a man who is self-conscious about your receding hairline or bald spot? Although there is no need to be, we understand your concerns and want to help you feel comfortable! Receding hairlines or balding are all apart of maturing for men. Some men start at a much younger age, while others may dodge the bullet altogether. If you look in the mirror and ask yourself “How do I hide my receding hairline?” or, “How do I hide my bald spot?” we can help. There are tricks in cutting hair for a receding hairline, and we know them! Professional hair stylists at Hair Mechanix will give you the perfect cut to match your face and head shape. There is a variety of ways to cut hair with a receding hairline. There are many male hairstyles that are designed to compliment a man with a receding hairline. 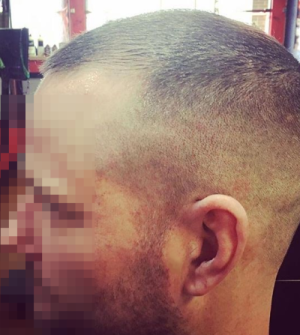 Are you looking to for a haircut to compliment a receding hairline with a widow’s peak? Are you a black male with a receding hairline? Is your hairline just receding period? If so, our talented and professional hairstylists will consult and recommend the one for you. Here are just a few hairstyles that will complement various types of receding hairlines in men. Men’s Undercut Hairstyle- This has become a very popular hairstyle, not just for men with receding hairlines, but for men in general. With a buzz cut to each side and length up top, you are able to comb your hair in the direction you need to cover your balding or receding hairline. You have the freedom to do what you please with the hair on top. Shoot, you can even put it in a man bun if you choose! Close Shave With A Beard- This is perfect for those who struggle with the hair on their head, but have no problem growing a nice shaped beard. Keep it close and tight on top and let it fade into your beard! Go Bald- Deciding to go bald can be a hard decision. But, you may just be thrilled at what it does for your look! Regardless of how you want your hair cut for receding or balding. Hair Mechanix will help boost your confidence with our selection of male haircuts for balding or receding hairlines. Contact us today to schedule your free consultation and find the look that best fits your needs!